We have a two-day cancellation policy. Late cancellations and no shows will be charged the amount of the first night. For pick-up from Stari Grad (ferry port) we charge 200kn (max 4 people) or 150kn for 1 person. We are excited to welcome you to Dink’s Place and Hvar! You will feel right at home here, and will meet other like-minded travelers on Hvar, the sunniest and most popular island in Croatia. Dink’s Place is very friendly and has a chilled-out, family atmosphere; it is the perfect place to absorb all that this special island has to offer. Where in the world are we? Hvar is a fairy-tale city with rich history, stunning architecture and nature, fresh, delicious cuisine, and vibrant nightlife that goes until dawn. Dink’s Place is only a short 7- minute walk to the town center, and is located in a tranquil neighborhood overlooking the sea, so you can also get a great night’s sleep to recharge after a night out! •Rooms: Private ensuite and dorm rooms with bunk beds. All rooms are clean, bright and spacious, with comfortable bedding provided, and include A/C in all rooms. •Towels: Bath towels are provided free of charge. Beach towels are available for rent or purchase. •Kitchen: We have a fully-equipped kitchen where you can cook meals using the best local ingredients (there is a supermarket a few minutes' walk away). •Hangout spaces: We have 3 spacious and shaded outdoor terraces, with a view of the Pakleni Islands. The terraces are perfect for dining or gathering in the evening for a drink with your new friends. What’s there to do, eat, and drink? 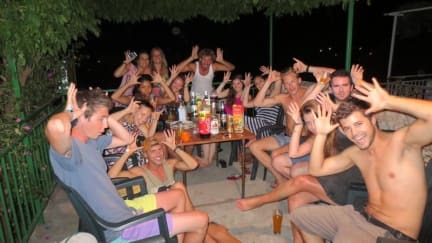 •Dink's Place is the exclusive partner of the Hvar Pub Crawl, the #1 Hvar nightlife attraction on Trip Advisor. Dink's Place guests have a guaranteed spot on the pub crawl- it's not to be missed! •Our guests receive exclusive discounts at our partners' bars and at restaurants where you can taste local specialties. •We organize outings every night to our favorite bars and clubs, with a free welcome shot for our guests. •At Dink’s Place you can rent bicycles, scooters or boats and visit untouched bays near the town, wineries where you can stop and taste homemade wine and olive oils, and see bright purple fields of lavender. Or you can just sunbathe, swim in the crystal-clear blue waters of the Adriatic, and enjoy an ice-cold beer or coffee. •We organize day trips to the stunning Blue and Green Caves. •Our staff members are warm and knowledgeable Hvar locals and travelers, who will go out of their way to help with anything you might need, day or night. We give you insider tips to find the best beaches, the best food, etc.! 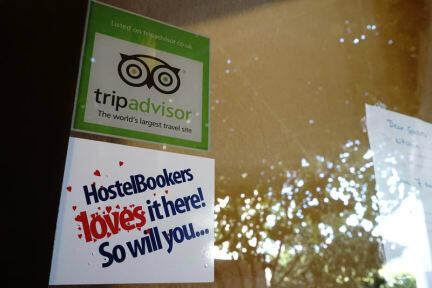 •Dink’s Place is also a member of the I Travel Balkans hostel network, connecting you to all the best hostels throughout the region, with great discounts and rewards. Coming by catamaran into Hvar town: Follow the path along the water, away from the city center. Follow the path until you come to a small pebble beach. To the left off the beach, take the steps and continue along the path which bends right, then left. Just go straight up until you come to a big junction (triangle). Continue straight along the main street Domovinskog rata. After walking for around 100m the roads splits into two (there should be a big tree in front of you), take the left road going uphill. Dink’s Place is on your left. Driving by car from Stari Grad: If you are coming with the car from port of Stari Grad, you will need to go left on the first big crossroad when you are entering Hvar town. Don’t go right to the center, go left to the gas station. After 200m, there is another crossroad, go left again. After around 100m the roads splits into two (there should be a big tree in front of you), take the left road. Dink’s Place is on your left. Dink’s Place was awesome! The staff were super friendly and went out of their way to make sure we had a great time! The facilities were great and the hostel has such a good vibe! Would highly recommend to stay here! Awesome little place with great staff, clean facilities and awesome atmosphere. The staff were heaps of fun, special shout out to Deli. Definitely recommend! Had an amazing time at Dink's! The staff where so friendly and energetic - they really created a great vibe. The place had great amenities and was super clean. Very fun and helpful staff, this can be a party hostel but the quiet hours are well enforced and the location is great with easy access to scooter rentals, the harbor and a fairly large beach. One of the funnest and best hostel experiences in my whole life. The facilities were great; good outdoor common areas, clean rooms and bathrooms. The staff is absolutely incredible. They cooked us a hostel meal one night, ordered food for us another night, helped us book a boat and scooters. They made any phone call necessary for you and were always there to help. Just great. Dink the owner is such a nice and genuine guy. I'm a big Dink guy. If you don't stay here you are an i***t.
Awesome place. Awesome Atmosphere. Really enjoyed my stay there. Rooms and other facilities are ok and cleaned. Staff was super. Dink's was a decent place. Large lockers under the bed for bags. Everything in hvar is close because it's so small so the location was fine as well. We visited at the end of the season so the atmosphere was very lacking with our room not even half full. I could see how it could be a good place in the high season though. Definitely a decent hostel. The rooms and bathrooms were very clean and well equipped. The kitchen was in a little hut in the yard which was nice but not that well equipped. It's a really small hostel therefore there wasn't a real common area but there was a nice terrace outside. Additionally they planned events for the evening to get everyone together which was nice. The staff was nice and helpful. It's a good place to stay but doesn't have a homey touch.